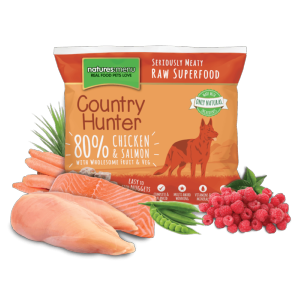 Ingredients: 50% Chicken, 30% Salmon, 4% Peas, 4% Swede, 4% Carrots, 4% Raspberry, Seaweed (1%), Spinach (1%), Yucca Extract, Green Tea Extract, Grape Seed Extract, Dicalcium Phosphate. Max loves his Salmon and raspberry nuggets! When he's happy I'm happy! !